Journey with Margo and Peter into their secret 'lost world' nestled in the heart of wet tropical rainforests. Adjacent to Wooroonooran National Park, their valley is abundant with tropical flora and fauna, including the endangered southern cassowary. Escape the crowd as you are guided through their sustainable bush food orchard in a small personalised group and taste the native fruits, raw and natural as evolution created them. Relax and enjoy a delicious bush tucker morning or afternoon tea while you hear the intriguing stories of the valley's early inhabitants. Hand made gourmet produce made with Rainforest Heart bush fruits are available for purchase. Morning and afternoon tour sessions are on Tuesdays and Saturdays and other days by arrangement. Rainforest Heart is a working farm and no public access is permitted - bookings are essential at least 24 hours in advance. The owners offer a personalised experience that caters for a maximum of eleven guests only per tour, ensuring that you are well informed and entertained during your visit. Journey with the hosts into their secret 'lost world' nestled in the heart of wet tropical rainforest. Escape the crowd as you are guided through their sustainable bush food orchard in a small personalised group and taste the native fruits, raw and natural as evolution created them. Relax and enjoy a delicious bush food morning or afternoon tea while you hear about the intriguing stories of the valley's early inhabitants. 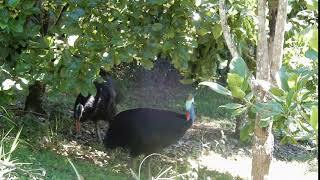 If you are lucky, you may see one of the valleys resident cassowaries strolling through the native fruit orchard or crossing the Four Wheel Drive track. Morning or afternoon tour sessions on Tuesdays and Saturdays. No public access - bookings 24 hours in advance are essential.